LEGOLAND® Florida Resort is Orlando's newest park. This 150-acre interactive theme park is just over 40 minutes from Orlando and dedicated to families with children between the ages of 2 and 12. 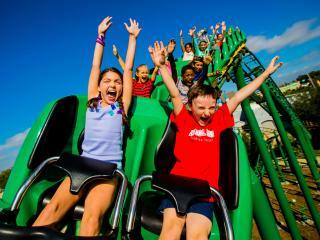 With more than 50 rides, shows and attractions, LEGOLAND® Florida Resort is geared towards family fun! The LEGOLAND® Florida Resort 2-Day Ticket gives you two days of admission which can be used anytime within a 14-day period to visit Orlando's newest theme park. The ticket does not include admission to the LEGOLAND Water Park. Explore great areas including 'City' - featuring a Driving School where children earn their first "driver's license" and families compete on Fun Town Fire Academy - a competitive ride that challenges families to get a fire truck from one side to another and put out a faux fire; Imagination Zone - where children can build on their imaginations and race cars against each other; DUPLO® Play Area - ideal for toddlers and their growing minds; Factory Tour - a first hand look at how LEGO® bricks are made from factory to finish; Castle Hill - a medieval area featuring an indoor/outdoor rollercoaster taking guests on a ride in and out of a castle where a dragon defends his treasure and Dino Island - where guests take a trip to prehistoric times and experience their first "thrill" ride. Admission to LEGOLAND® Florida Water Park is not included with this ticket.